In quite typical subject matter for Millet, this painting depicts one of the hardships of the impoverished which has, thankfully (although ones fears it has simply been replaced) disappeared from modern life. Gleaning is the act of scouring the field for stalks of crop missed in the first harvesting. One needed a licence to be allowed to do this, and only the poorest, most desperate would undertake to obtain one. Thus the three main figures in the painting are immediately identifiable as of very low social status. It is the idea of their place in society, or lack thereof, which Millet seems to be occupied with in this piece. The piece was created while Millet was in Barbizon, and one of the leaders of the Barbizon School, which sought a return to Nature in art. For most members of the group this meant landscape painting, but Millet focused on figures within landscapes, almost as if portraying what had become Nature, as humans had tilled the earth for thousands of years. A champion of the rural working class in his paintings (he was not an overtly political figure in actions), he often depicts people working in the fields, such as in The Sower (1850) or The Angelus (1857-59), but these are usually people who have found a place in society, they are part of the workforce. The Gleaners however depicts women who have no place, or have through poverty lost their place, in society. As we look into the painting, we are presented with a visualisation of the rural social hierarchy. The further back we recede into the picture depth, the higher the rank of the people depicted. At first we see the gleaners themselves, then behind them is the communal workforce, cutting and reaping the harvest. Further back still they are overseen by a figure on horseback, with the large domestic buildings highlighting the figure. This was a time when owning a horse was still a major indicator of wealth: Benz did not create his automobile until the 1880s, and the gap between rich and poor had not reached a point at which it was viable for the majority of people to own horses. The low skyline of the piece, little more than half way up the canvas, emphasises this sense of recession, and of the distance between the gleaners and the rest of the community, a distance symbolic as well as physical. Millets demonstrates to use how these people’s poverty has lead them to being marginalised by society, and shut out from the support of the community. Millet shows this through symbolic contrasts and parallels. The small sheaves that the women have gathered are contrasted diagonally with the huge stacks that the group have gathered. Nature’s bounty as visualised by the stacks, with more further in the background, and more sheaves waiting to be piled, is pitifully contrasted with the small number of sheaves gathered by the gleaners, and the stalks in their hands. The women’s clothes are homespun, heavy materials, the stiffness of the red cloth tied with a piece of rope around the woman’s arm portrays a feeling of discomfort. The unity of the group, working together, all bending and lifting as one, is again contrasted with the three women, one of whom is almost standing straight, creating a sense of disunity, jarring against the shared pose of the other two women. The standing woman’s pose is almost torturous; she seems to have taken a pause, connoting the aching back brought on by this repetitive physical labour, but we do not see her at the point of relief, but as she returns to her work, recommencing the arduous, virtually thankless task. In the sky above, a flock of birds passes over, with stragglers falling behind, mimicking the figures down below. Thus Millet fills the painting with pathos, and as viewers it is hard not to empathise with the plight of these women. Even Millet’s use of light suggests the women’s struggle, as the sun shines down on the house and the group, whilst they are nearly in shadow, on the edge of darkness. The Gleaner’s was fist unveiled at the Salon of 1857. While the painting may seem fairly innocuous to modern viewers, its focus on the lives of peasants and the working classes was seen as politically threatening by the middle and upper class audience who saw it at the Salon. The latest of France’s revolutions was only in 1848, when in February the Orlean monarchy was overthrown only to be replaced by an increasingly conservative government in the Republic, which lead to a bloody revolt in June 1848, and the eventual election of Louis Napoleon as President (who would become Napoleon III, leader of the Second French Empire). After this turbulent recent history one can understand a certain sensitivity amongst parts of society to subjects which seemed to glorify the peasant classes. However Millet’s interests were not explicitly political, he was a religious man who looked to the working classes as examples of the continuation of Old Testament piety and spirituality, rather than as the future leaders of France. His audience had more cause to be worried by Courbet’s works, which were heavily influenced by Millet, and more overtly political. The Stonebreakers, of 1850, for example, actively confronts the viewer, with the cruel reality of abject poverty, with similar themes and motifs to The Gleaners, but carrying them to more upsetting extremes. By comparison Millet’s pieces seem fairly tame. 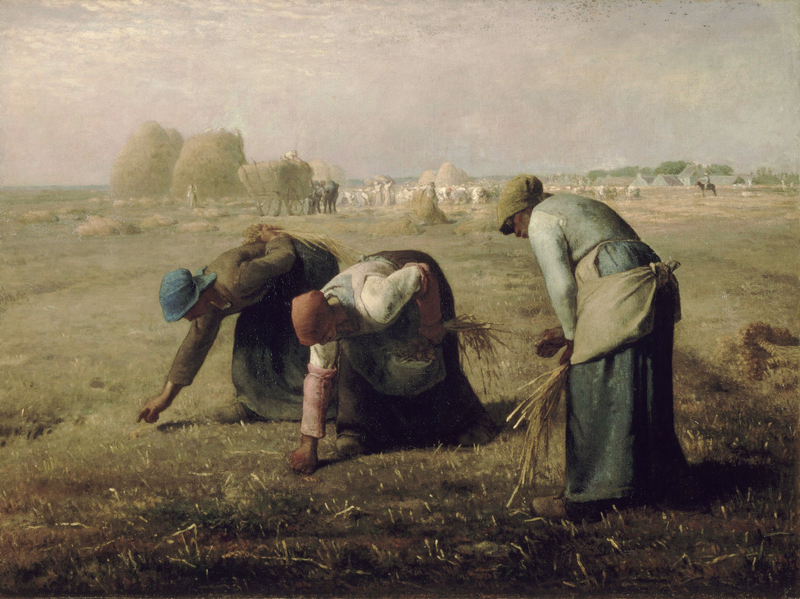 While the scenes Millet depicts in The Gleaners have long since vanished from France, the ideas he presented are as eternal as he makes their actions seem. The marginalisation of the poverty stricken is an issue which remains relevant, although we can only hope that the modern middle and upper classes would react to a modern Millet in a slightly more positive way than to see it as a call to revolution. Thanks. This is really helpful.